This recipe can easily be adapted for more artichokes. Cut stems from artichokes so they sit flat. Cut upper ⅓ of artichokes off with a very sharp knife. Be careful because the thorns are sharp! Using a pair of kitchen shears, cut the tops of remaining leaves off to remove the thorns. Rub all of the cut surfaces with ½ of the lemon and place cut-side down on a plate. Working with one artichoke at a time, remove the center petals and the fuzzy part of the flower beneath them - we find that a grapefruit spoon works perfectly for this task. Squeeze lemon juice into the center of the artichoke, and return to plate, placing cut-side down to prevent oxidation. Once both artichokes are cleaned, mix together the stuffing. In a small mixing bowl, stir together the bread crumbs, cheese, parsley, and seasoning with a fork. Drizzle olive oil into the mixture, stirring until evenly distributed. Turn artichokes right-side up and drizzle with olive oil. Working with half of the stuffing mixture, hold artichoke over the bowl and press petals widely . Fill the center and as much in between the leaves of the artichoke as you can. Place artichokes right-side up in deep, lidded pot with about 1 inch of water and the reserved lemon half in the bottom. Steam over medium-high heat, keeping an eye on the water level and adding more as needed, for 1 hour. The artichokes are done when the petals closest to the center can be pulled out easily with a pair of kitchen tongs. Serve in bowls and bring a large bowl to the table for discarding the petals as you eat them. 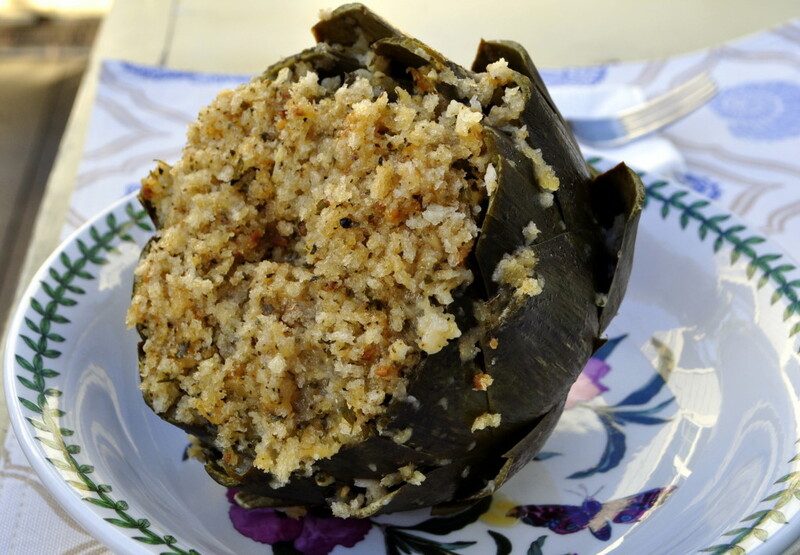 Cut the artichoke heart with a knife and enjoy it with the remaining stuffing.